Historically, NASA burns all its human generated waste in special containers upon atmospheric re-entry. Waste doesn’t need to stick to its name, however, so why not transform it into something more useful like fuel, oxygen or waster. Such a system was devised by researchers at University of Florida for a potential human colony on the moon that turns organic matter or packaging into biogas, water and oxygen. In fact, the waste generated by a four-person crew living on the moon for a year would be more than enough to produce fuel for a return trip back to Earth. For a few years, NASA has been planning a tentative manned outpost on the moon that should go live by 2020. The logistic hurdles are immense, and self-sufficiency is key if people are to live on the moon for long periods of time. Crew members need to print their own tools, make their own food and oxygen through whatever means necessary and only re-supply resources that are indispensable and can’t be produced on site. As for waste, you can’t dump it on the lunar surface – that’s out of the question. Bringing it back on Earth, however, means a lot of lost fuel due to the extra weight. The smart thing to do is to turn it into a fuel, so you then have extra fuel and excess weight. It’s perfect. The system is an anerobic digester that uses microorganisms break down biodegradable material in the absence of oxygen. 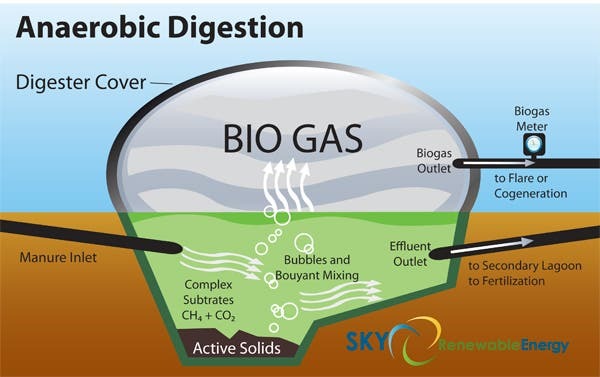 One of the end products is biogas, which is combusted to generate electricity and heat, or can be processed into renewable natural gas and transportation fuels. A typical digester’s flow process begins with bacterial hydrolysis of the input materials in order to break down insoluble organic polymers such as carbohydrates and make them available for other bacteria. Acidogenic bacteria then convert the sugars and amino acids into carbon dioxide, hydrogen, ammonia, and organic acids. Acetogenic bacteria then convert these resulting organic acids into acetic acid, along with additional ammonia, hydrogen, and carbon dioxide. Finally, methanogens convert these products to methane and carbon dioxide. Pullammanappallil and colleagues first received a packaged form of chemically produced human waste from NASA that also included simulated food waste and packaging materials, to see how much methane (the fuel) could be produced from it and how quickly. The researchers found that in a week, they could produce 290 liters of methane per crew per day which could be used for heating, electricity generation and fuel. Additionally, the process generates almost 750 liters (200 gallons) of non-drinkable water as a by-product, according to the paper published in Advances in Space Research. The water can then be split by electrolysis into oxygen – used for breathing – and hydrogen, as an additional fuel source which can be stored. Of course, if it works on the moon, the same digester can very well work on Earth – and it does. The biogas industry is growing year on, but we’re still far off from an integrated solution for urban centers, where copious amounts of waste are being generated.